If I close my eyes, I can actually taste the oatmeal bread my stepmom, Val, used to make for me. One loaf was virtuously set aside, and then she would break the major rule about allowing bread to cool before cutting it, slicing the second loaf while it was still piping hot and slathering it with softened butter that melted and ran into the crumb. The oatmeal gave the gently sweet bread a chewiness that was beyond satisfying. With the simple smear of butter, it was heavenly. That second loaf, though, when allowed to set up and cool, was sliced and toasted in the most perfect toast topped generously with whichever preserves were at hand. It was blissfully delicious. I’ve played with Val’s oatmeal bread and added Nature Valley Toasted Oats Muesli in place of the oats. This gorgeous combination of toasted oats, sliced almonds, pepitas, dried cranberries and blueberries, sunflower seeds, and other goods does the same magic the oats did in Val’s bread, but with a little extra oomph for that toasting end of things. 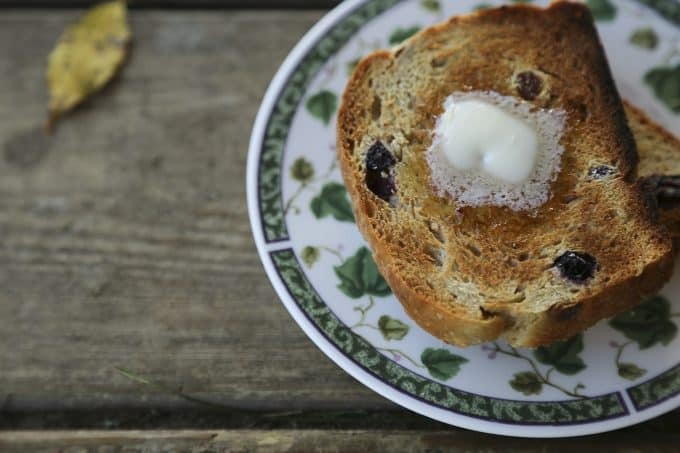 Muesli Toasting Bread – Granola Bread, makes the ULTIMATE toast, ready to catch sweet cream butter as it runs in rivulets and hold up scandalous amounts of your best loved jams, jellies, preserves, or marmalades. There’s something so perfect about the slightly nutty toasted oats, dried fruits, nuts, and seeds when they’re toasted in this perfect Muesli Toasting Bread – Granola Bread. 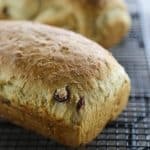 Muesli Toasting Bread - Granola Bread, makes the ULTIMATE toast, ready to catch sweet cream butter as it runs in rivulets and hold up scandalous amounts of your best loved jams, jellies, preserves, or marmalades. Use a whisk to combine the Nature Valley Toasted Oats Muesli, brown sugar, wheat flour, and salt in a medium large mixing bowl that is heat safe. Drop the pat of butter on top, pour the boiling water in, and whisk until the sugar is dissolved and the butter is melted. Cover the bowl and let it come to room temperature. Stir in the warm water and the active dry yeast until evenly combined. Add the all-purpose flour to the bowl and stir with a sturdy spoon until you have a shaggy dough. Turn out onto a generously floured work surface. Knead, adding flour 1 tablespoon at a time, until you have a smooth, cohesive, still slightly tacky dough. Put into a mixing bowl (it can be the bowl you used to mix up the dough, scraped clean), cover with a damp tea towel, and leave undisturbed to rise until double in size, about an hour, depending on room temperature and humidity. Divide the dough in half, shape, and place into lightly greased bread pans. Cover again with the tea towel and let double in size once again. While it is doubling, preheat the oven to 350F. Bake the bread for 30 minutes, brush with melted butter, and return to the oven for another 5 to 10 minutes, or until golden brown on top. Remove the pans from the oven and turn the bread out onto metal cooling racks. Let cool completely before slicing. This bread is wonderful as toast! I love bread that is crunchy when toasted (like english muffin bread) with honey on top. Yum! I love your recipes Rebeccah – I made the apple cider molasses (?) last week and have been enjoying it with sparkling water – yum. Thank you so much, Kel! I’m glad you love my recipes. I love having you read them! I like a strong wheat bread that’s a bit nutty, preferably the heel, with a heavy drizzle of honey. This recipe sounds delicious! We love to make different kinds of bread at home. We have not bought store bread in years. I have this recipe pinned to save and share. I love whole wheat toast with butter, topped with cinnamon and sugar. Love fig and goat cheese on any bread! 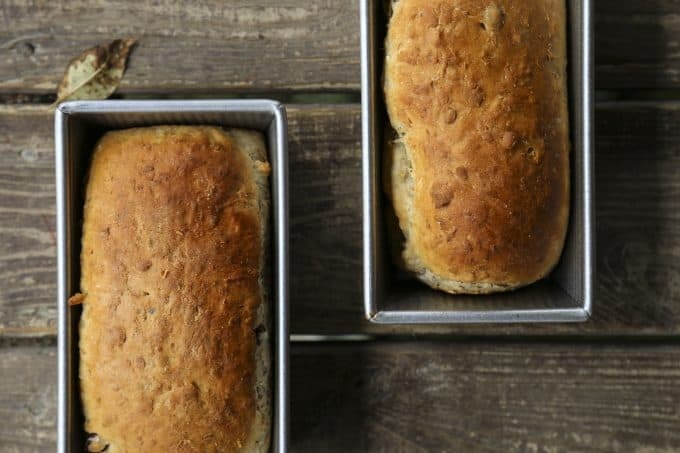 Made this bread yesterday – it was everything you said it was! Love it for toast – and just plain ole good with sweet cream butter slathered on. 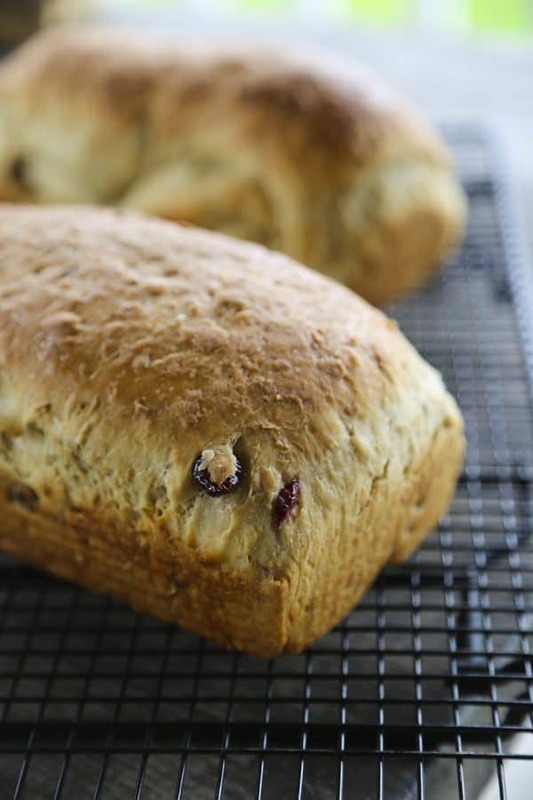 Am making the muesli bread again today – my hubs and I just love it! I also bought your “Not Your Mama’s Canning” book – made your cranberry ketchup. Am really enjoying your blog! I’m so glad to hear you’re enjoying “Not Your Mama’s Canning Book” and the blog! I really appreciate it, Reni! Planning to make this for Christmas gifts. Is there any reason to NOT use whole wheat flour rather than all purpose; or maybe a combination of both? Thanks for the great recipes, and Merry Christmas! Are you experienced baking with whole wheat? I think you could safely substitute 1/3 of the flour with whole wheat, but you’ll want to allow extra time for rising as whole wheat can take longer… And thank you so much! You are so kind! Love, love this recipe!! Made it twice and both times it was perfect!! Hello! I’m confused regarding the baking temperature. HAVE MADE THIS BREAD TWICE AND BOTH TIMES IT WAS PERFECT!!! I HAVE FINALLY FOUND A BREAD RECIPE WHICH WORKS!! AND TASTES BETTER THAN THE EXPENSIVE ARTISAN BREADS!! I’m so glad you like it, Margaret! I have tried this recipe multiple times, following it to a T and I really want it to work but it’s just not rising right. It’s rising some, but not enough. Any tips? It sounds like you’re going to have to let it rise longer, Malia. There are so many factors at play in bread rising, that it sometimes takes experimentation to find out what works best in your kitchen. Does your kitchen tend to be a little on the colder side? Is the bread dough in a draft-free, warm place when it rises? If you have a drafty kitchen, a good solution might be to put your bread dough in an oven that’s off with a pan of hot tap water on a shelf below it as it rises.